When I was in school, we started each day with a D.O.L. (Daily Oral Language) warm up. My teachers would put a sentence on the board or overhead, and we would copy it into our spirals exactly as we saw it and the use a red pen to fix all of the spelling, grammar, and convention mistakes. Most students today, from what I seen, don't do these types of activities anymore. There is such an emphasis on "authenticity" in the classroom, that it seems many teachers have shunned these assignments in hopes that these skills will be learned during other writing activities. The problem, though, is that students aren't getting the basics because they aren't taught the rules of our language. It shouldn't be the case, but year after year, my middle school students come to my classroom not knowing what a noun is much less how to diagram sentences. How can I expect them to edit their papers (or their peers' papers) when they don't even know how to punctuate dialogue properly? 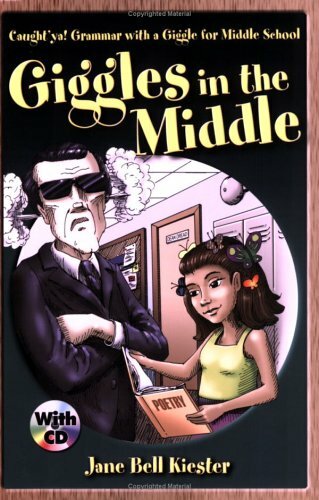 A while back, I came across this wonderful book called Giggles in the Middle by Jane Bell Kiester (this is a newer version of her Caught'ya! series), which is really a modern approach to D.O.L. in the classroom. The concept is the same, only instead of random sentences each day, they build upon each other and tell a hilarious story that carries students throughout the year. It becomes one of those activities that students look forward to seeing on the board each day because they want to know what happens next in their story. The book has been sitting in my Amazon wish list for months, but I was lucky enough to sub for a teacher who was using it in her classroom. Not only was I able to read the entire book that day, but I was able to see the plan in action. I saw how motivated her students were to find and fix all the mistakes and witnessed an academic conversation in that classroom that most teachers only dream about. A debate over whether or not this sentence should start a new paragraph? Priceless! The book takes D.O.L to the next level by including vocabulary, journals, and other writing assignments to expand the learning experience. Bonus: the middle school version includes three stories, one for each grade, which is helpful for those teaching more than one grade. Also, all of the sentences, corrections, and assessments come on a handy CD, making it easy to duplicate and/or project in your classroom. I highly recommend this book for any language arts teacher or even for parents who want to help their struggling writers gain confidence in their editing abilities at home!